Before you wonder, no, there won't be a part 4 in this series! Only once I started writing, did I realize there is no way I could put this in one or two posts without having you dozing on your laptop even before you make it halfway through. Here is the last part for you. Images from the internet. Ribbon stage : This term is commonly used while whipping eggs or yolks and sugar for foam cakes. You need to whip till the egg mixture looks pale, turns thick and forms a ribbon or falls in a ribbon like pattern. When you have whipped for the approximate time as directed and lift the beaters away from the egg mixture, it will fall or drop from the beaters in a flat ribbon like pattern, stays on the surface for a few seconds before disappearing back into the mixture. This shows that the mixture has been sufficiently beaten. Watch the first 30 seconds of this video. Room temperature, butter : Recipes for butter cakes, cookies etc specify that butter should be at 'room temperature'. This means that the butter should be slightly cool and just pliable. It should only give slightly when pressed with your index finger. It should never be gooey or oily. The stick in the middle seems to be the one at the optimum temperature. I have never really checked, but it should be 65 degrees F (18 degrees C) and 70 degrees F (21 degrees C) as mentioned in Joy Of Baking. This temperature allows the maximum amount of air to be beaten into your batter. 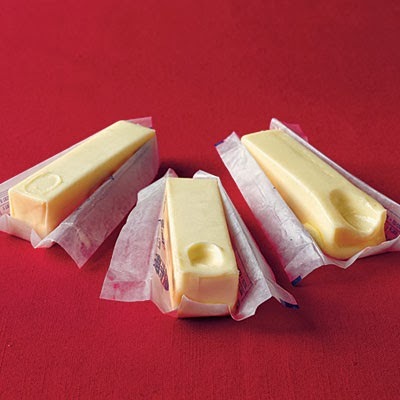 To bring refrigerated butter to room temperature, cut in into cubes and leave it on the counter for about 30 minutes approximately. You could soften it in the microwave, but its very tricky, so best avoided. Rolling butter in between parchment is also done. Stiff peaks and soft peaks, egg whites : Recipes guide you to whip whites till they form either soft or stiff peaks. As you whip, stop and lift the beaters slowly. If the peaks stand up but droop back (NOT the same as flopping back right away) you have reached the soft peak stage. Beat and wee bit more (30 seconds to a minute) and the peaks will stand up in shiny, pointed peaks and not droop back. Stop right there! If you whip any longer, the whites will dry out and be very difficult to fold in. Adding cream of tartar in the right quantity to the whites helps prevent over beating. Watch Rose here 4.30 minutes into the video. Scant : A scant teaspoon means just about a teaspoon, a teeny little less than a teaspoon (as opposed to a heaping teaspoon). These measures are not really accurate, but work fine as a rough guide where you can add ingredients to taste. Scrape down: When you mix batter for cakes and the kind, the recipes direct you to 'scrape down the sides'. This is just taking your spatula and turning it around in your mixing bowl, so as to scrape the batter or any unmixed ingredients in the bowl back into the batter. Important as this helps ensure that all the ingredients in your recipe are well incorporated into the batter. 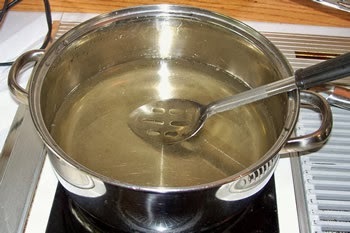 Stir : Your stir together ingredients when you just mix them with a spoon or something similar in a circular motion. Note, this again is just for simple mixing, not for creating volume. Spoon and sweep method: This is a commonly used method for measuring flour, I used to follow this before I got my kitchen scales. Keep the measuring cup on a level surface like your counter. 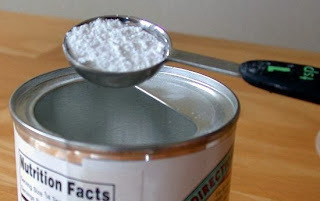 Loosen the flour in your flour container, scoop out the flour with a large spoon and spoon it lightly into the cup. Do not shake or tap the cup. When the flour is a bit over the rim, take a knife or a scale and sweep off the excess flour. This gives you 130 grams of flour. Sift : Sifting dry ingredients in baking is for aerating and incorporating them into each other. You also need to sift cocoa, cornflour and powdered sugar to get rid of lumps before you measure. Since sifting increases volume of flour, pay attention to whether the recipe states the flour as 'sifted flour' or 'flour, sifted'. If its sifted flour, you first sift the flour and then measure. If its flour sifted, you first measure and then sift. This is specially relevant if you do not weigh ingredients and just measure them using standard measuring cups and spoons. A cup of all sifted purpose flour weighs 115 grams, a cup of all purpose flour measured by dip and sweep method weighs 140 grams, a cup of APF measured by spoon and sweep method weighs 130 grams. Simple syrup : This is just water and sugar heated together (till the sugar dissolves) in varying proportions to get different density of the syrup. Used for brushing on foam cakes and the kind to moisten it, to poach fruit etc, the standard usually is a ratio of 1:1. You could always alter the amount of sugar to taste. Nothing to stop you from flavoring it with herbs or lime or cinnamon or anything you please! Sponge: This could as a baking term refer to (a) kind of cake (b) a component of yeast dough. Sponge Cake : One which uses eggs as their main leaveners. Whole eggs as in foam cakes like genoise and fatless sponge or with beaten egg whites as in chiffon cakes. Sponge (as part of yeast dough)/ starter : Usually a mix of yeast, liquid and flour that's allowed to sit for some time before adding it to the rest of the dough ingredients. Called by different names, this helps develop more flavor in the bread. Again, slight differences in the components, the consistency, the duration of fermentation, gives these different names. Read this to know more. Sourdough (above) : Have never tasted one or ventured to bake one yet! Supposedly, in sourdough breads., the dough and the bread have a high level of acidity. The pre-ferment here is a sourdough starter which you cultivate at home mixing flour and water (no yeast) and let natural or wild yeast grow in it. This starter is 'maintained' (a big story!) 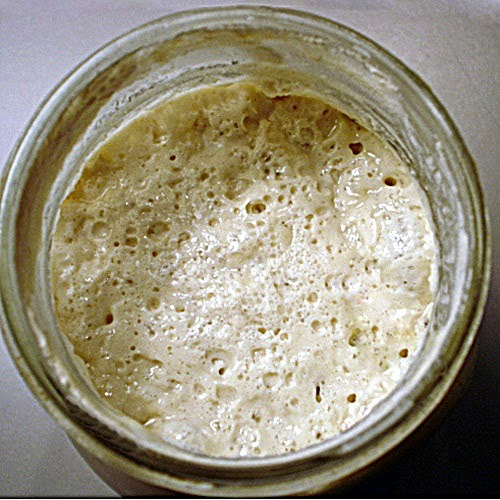 and used as a leavener for baking breads, either with just the sourdough starter or sourdough starter plus commercial yeast making it a 'mixed starter'. Sourdough breads have complex flavors and a distinct crumb, more here. I hope to get there someday! Straight rise : This refers to the method of baking bread the simplest way without using any kind of starter. Just mix all ingredients, let the dough proof twice and bake! Torte : A torte (as a kind of cake ) usually refers to one with very little flour, more of ground nuts or bread crumbs. 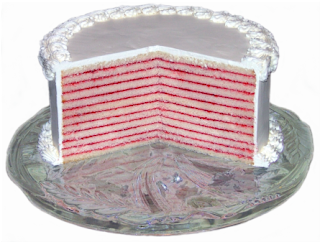 To 'torte' a cake means to slice the layers into thinner layers for filling and then frosting the cake. Toss : You normally toss one thing into another so as to coat the ingredients. Cubes of cold butter are tossed in flour to coat the butter with flour while making puff pastry, pie crusts etc. Temper : One of the reasons why chocolate is tempered is to get that superb gloss to your decorations. Read more about this here. You also temper egg mixture while you make custard and custard based desserts as given under 'Dribble' in my previous post. Unleavened : Usually used in the context of flat breads and crackers, these are made without any kind of leaveners like baking powder, baking soda, cream of tartar or yeast in them, hence they do not rise much. Chapati or rotis are classic examples of unleavened Indian breads. Whip : You use a hand held electric mixer or a stand mixer for whipping cream or eggs. Whipping helps incorporate air into your cream or eggs. Whisk : You could whisk liquids to just combine them or whisk vigorously with a wire whisk to incorporate air. Go by the recipe directions and the objective of whisking. Zest : Removing the outermost part of the rind of citrus fruits like oranges, limes and lemons is called zesting. The zest gives amazing aroma to your bakes. Best tool to use is a citrus zester. Thank you so much for this.For taking the time out to compile this for us. So useful. Carrot Cake Macaroons. Flavorful Little Bites!